CLEVELAND (AP) — Corey Kluber says the goal each time he takes the mound is to give the Cleveland Indians a chance to win, rather than getting the W himself. “More so than actually getting the win, it’s giving our team a chance to win. That’s what I base things on,” he said. The Indians moved closer to their third straight AL Central title and reduced their magic number for clinching the division to nine. 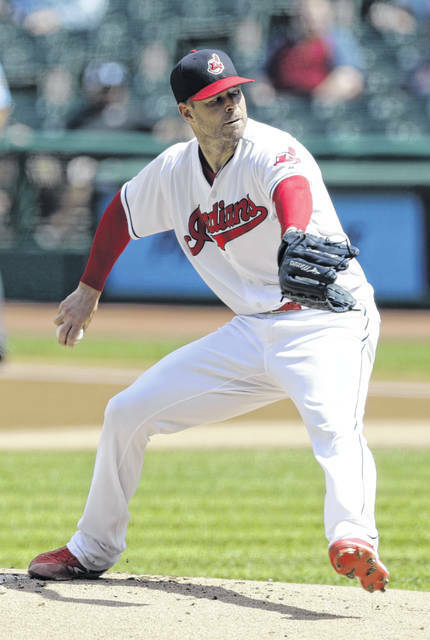 Kluber has won six of his last seven decisions and is a leading candidate to be chosen the league’s best pitcher for the third time in five seasons. Luis Severino of the Yankees was set to start Wednesday night at Oakland. “The last couple times out, seemed like he started to get the feel back. That’s fun to watch,” Indians manager Terry Francona said. Alex Gordon lined a double on a 3-2 pitch in the fourth. Hunter Dozier struck out, but rookie Ryan O’Hearn’s long drive was over center fielder Greg Allen’s head and fell for an RBI triple. “I felt like my fastball was pretty good and I hydrated myself all last night, so once the adrenaline kicked in when I got out there, I felt pretty good the whole time,” he said. Edwin Encarnacion’s RBI grounder broke a 1-1 tie in the fifth. Allen’s RBI single in the second gave Cleveland a 1-0 lead before Kansas City tied it. Michael Brantley’s one-out single started the go-ahead rally. Shortstop Alcides Escobar couldn’t handle Yandy Diaz’s chopper and Brantley took third when the ball rolled into the outfield on the error. Encarnacion’s grounder put Cleveland ahead. Cody Allen, the Indians’ closer until Hand was acquired, struck out two and retired all three hitters in the eighth. Oliver Perez struck out the only batter he faced and Cleveland’s pitchers combined to fan 16. Royals right fielder Brett Phillips was out of the lineup after running full-speed into the wall chasing Jose Ramirez’s fly ball Tuesday. He was removed from the game an inning later. Phillips was diagnosed with a bruised right shoulder. Indians 3B Josh Donaldson was scheduled to play for Double-A Akron against Altoona in the first game of the best-of-five Eastern League playoffs on Wednesday. He’s on the disabled list with a strained left calf, which has prevented him from playing in a major league game since May 28. Donaldson, acquired from Toronto on Friday, is eligible to be activated Sept. 11. It’s unclear how many minor league games he’ll play before joining the Indians. “The doctors said he can’t have another shot for a while, so it makes sense just to shut him down,” manager Ned Yost said. Indians: LHP Andrew Miller (sore shoulder) is expected to throw a bullpen session on Thursday in Toronto. He’s been on the disabled list since Aug. 29.